My Brown Butter Cake seemed like the most delightful cake to mark my fourth blogiversary at Delightful Repast. 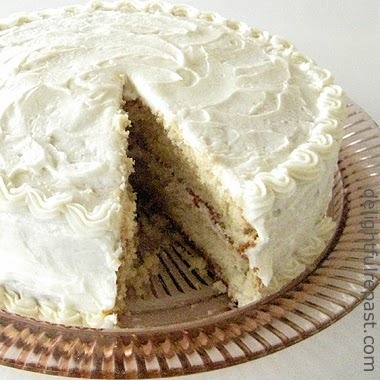 It's one of my favorite cakes, one that can be filled and frosted all sorts of ways. 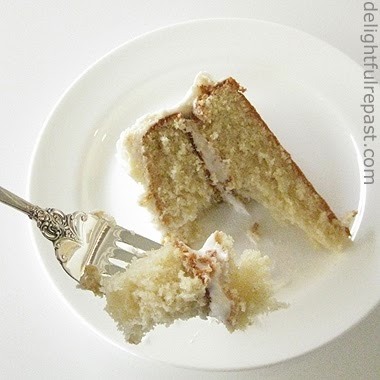 Today I used Brown Butter Frosting for both frosting and filling, making for a cake that is subtle but intense! Have we talked about brown butter yet? I mean, I know I've posted my Gluten-Free Cinnamon Rolls with Browned Butter Icing and maybe a couple other browned butter things, but I don't think I really went on and on and on about the wonders of brown butter. And it really is the best flavor on earth! I developed this recipe years ago, first as a regular vanilla butter cake, and it always gets raves. With plain butter, it's a wonderful cake; but browning the butter gives both cake and frosting a complexity that takes it over the top. Though I've listed the cake and frosting recipes separately, in case you want to make one without the other, if you're making both you can brown the butter for both at the same time. I find it easiest to do it in two separate small pans. Can't believe I've been blogging for four years! Of course, I don't post several times a week as some bloggers do. Just once a week. I figure most people don't have time to visit more often than that anyway. I so appreciate all of you who follow the blog here and on Twitter and Pinterest. If you enjoy Delightful Repast, I hope you'll share it with all your friends, relatives, coworkers, social media peeps and mere acquaintances! 1 In a small saucepan, melt the butter over medium heat. Continue cooking, stirring or swirling frequently, until butter gets foamy and bubbly and just starts to turn light tan and smell nutty. You cannot take your eyes off it; it can go from brown to black in a flash! Set the pan in the refrigerator for 30 to 60 minutes to firm up the butter. 3 In bowl of stand mixer fitted with flat beater (or in a large mixing bowl, if using a hand mixer), combine all the dry ingredients and mix on low speed for one minute to blend. Add the soft-but-solidified brown butter and remaining milk. Mix on low speed until the dry ingredients are moistened. With mixer on medium-high speed (speed 5 on my Cuisinart stand mixer), beat for 1 1/2 minutes. Scrape down the sides. 4 Gradually beat in the egg mixture in three batches, beating for 20 seconds after each addition. Scrape down the sides. 5 Pour into prepared pans. Bake for 30 to 35 minutes. Cool in pans on wire racks for 10 minutes. Remove from pans and cool on racks for an hour. 1 In small saucepan, melt butter and salt over medium heat. Continue cooking, stirring or swirling frequently, until butter gets foamy and bubbly and just starts to turn light tan and smell nutty. You cannot take your eyes off it; it can go from brown to black in a flash! Set the pan in the refrigerator for 30 to 60 minutes to firm up the butter. 2 In bowl of stand mixer fitted with flat beater (or in a large mixing bowl, if using a hand mixer), beat the brown butter and the softened butter until smooth; add vanilla. Beat in powdered sugar in about 4 batches, alternating with a little milk, as needed to make frosting smooth and spreadable. Well, I'm going to make 1/2 recipe in a single layer. I won't be tempted to eat quite as much that way. I haven't decided whether to beat three eggs and divide the liquid in half, or throw all caution to the wind and use 2 eggs in the batter. I'd probably throw all caution to the wind and use 2 eggs! Let me know it works! Oh, wow. This sounds so delicious. Thanks, yummychunklet! Glad I froze some of it to have next week. Husband approved! We're each enjoying a slice right now. I made a single layer, but cut it in half and stacked them so we'd have a layer cake, just not enough that we'd make complete piggies of ourselves. If our freezers weren't so full, I'd have made the full recipe. I'd never used browned butter before. It certainly imparts a distinctive (and delicious) flavor! I'm so glad you both liked it! I sure can't have a whole cake sitting around if we're not having company, so freezing half or just making half makes sense. Brown butter makes almost everything taste better, isn't it? Your layered cake looks very beautiful. I've not heard of a brown butter cake before but it sure sounds good the way you describe it! I'm sure I'll find an occasion worthy of such a decant dessert. I'm wondering if brown butter can be added to other desserts recipes as well. Happy blogiversary, Jean!! And what a gorgeous cake to help celebrate the occasion!! Angie, thank you! You've been blogging a long time, too. Richard, I think you'll like it! I add browned butter to all sorts of things, sweet and savory. Thanks, Jenn! I used to make fancy cakes--basketweave, borders, roses and all sorts of flowers--but those days are gone! Sully, I like that - "virtual taste buds." And yours are in good working order if you recognize the deliciousness in the absence of chocolate! That cake looks moist and delicious! And I love that gorgeous plate. Thanks, Judy! My mother had that plate since I was a little girl, so I love using it. Happy 4th Blogaversary!!!!! I'm so glad I found you online and love your creative take on food. Here's to many more years! Thank you so much, Melissa! And I hope any readers looking to build a creative life will visit your blog. Happy 4th Jean, and a wonderful cake to celebrate with. Is brown butter worth the effort? I never tried it so I'm completely oblivious! Thanks, Charles! It really is worth the effort to brown the butter. Of course, I like the cake with regular butter, too. The brown butter version is like another flavor altogether, you might say. Hello Jean . . . I agree with Annie, we want a zero calorie cake :) Calories or not this looks delicious and makes my mouth water. Connie, thank you! I wish I still had some of it. There IS one piece in the freezer, but it's for my husband.